Perhaps a little confusing is the common name for this tree. 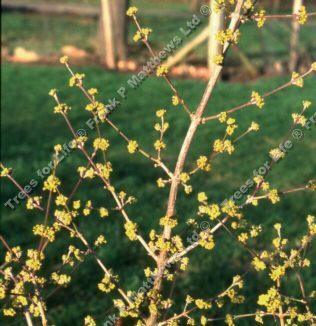 Whilst a flowering dogwood tree, it is commonly known as the Cornelian Cherry tree (Cornus mas). This is a pretty, spreading tree with an open form. Attractive oval dark green leaves turn to a beautiful reddish-purple in autumn. Tiny yellow flowers appear in February. There are several ‘fruiting' forms selected for their abundant astringent pearl drop fruits that make excellent composts and jams. This tree is supplied at a height of between 1.3 and 1.7 metres in a 12 litre container for year round planting and better results than from either bare-root or rootballed stock.